Русская версия данной страницы (Russian version of this page). The main feature of this application is to eliminate text input on an inconvenient phone keyboard. Application doesn't ask to type a right answer. You choose whether your answer was correct or not. 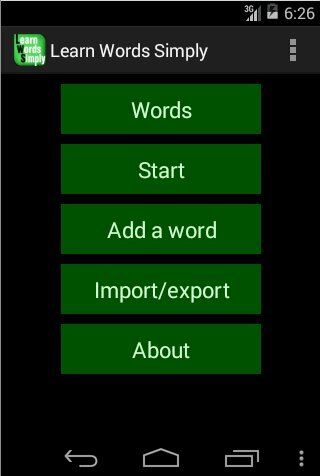 Your can type words on a laptop and then import them to the application. Application is designed for small vocabularies (20-100 words). Don't try to import large vocabularies! It's convenient to use the Dropbox service. Create an vocabulary file. For example voc1.txt. File encoding mus be UTF-8. If you are working in Windows you can use Notepad++ editor. Upload the file to your Dropbox account. Import your vocabulary to the Learn Words Simply application: "Import/Export" -> "Import from file". We plan to add direct import from Dropbox to the application. Add direct import from a Dropbox account. Move well-known words to the second dictionary to check them later. Спасибо за полезную программу, но для ее практического использования не хватает возможности смены направления перевода на обратное и вразнобой. Это планируется? Сейчас сделано вразнабой. Задавать вручную направление пока не планируется. Да и зачем? I plan to implement dictionary export in the next version.